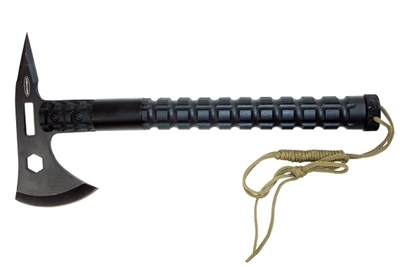 Smittybilts New Survival Trail Axe comes with a 4 x 7” Heat Treated Stainless Steel blade. Smittybilt Logo stitched in Sheath and two built in tools, D-Ring Wrench and 3/4 Hex wrench in axe head. This is the Ultimate Trail Survivor tool. Includes Survival canister with matches, band aid, string etc.